The Menz-Guassa Community Conservation Area (“Guassa”) is a 100 km2 Afro-alpine grassland in the north central highlands of Ethiopia. Guassa and its surrounding landscape straddle the catchment basins of two major rivers in East Africa – the Abbay (the Blue Nile) and the Awash, and its conservation is critical to the health and functioning of those headwaters. 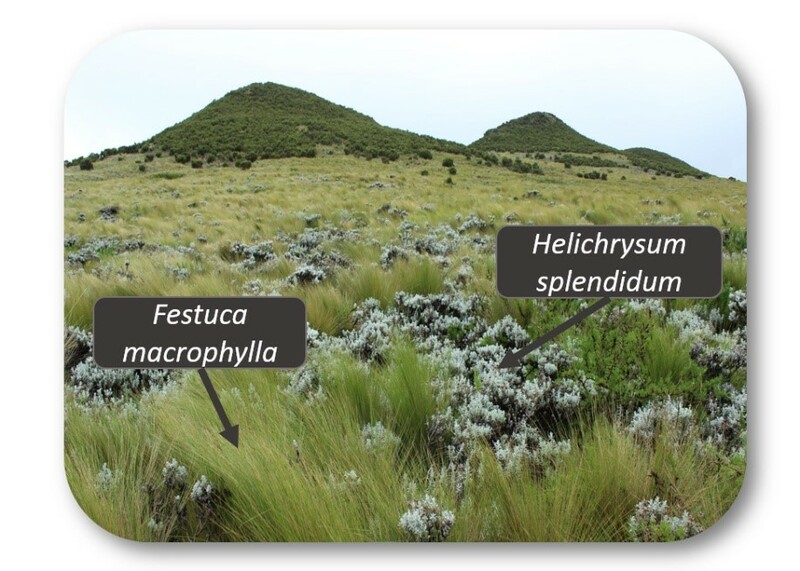 But the people who have used and managed this area for over 400 years are more concerned with the local benefits it provides, most importantly the four species of guassa grasses (Festuca spp.) that are highly valued for their use as thatch, rope, construction material, and forage. From the 1700s until the Imperial regime of Haile Selassie, Guassa was managed according to a traditional system of rules and sanctions called “Qero” (see Ashenafi and Leader-Williams 2005 for a detailed description of this system). In 1974, a Socialist military junta called the Derg overthrew the Imperial government and began a series of land policy reforms, including the end to privately owned land. The communities around Guassa were no longer able to enforce their traditional rules that prevented outsiders from grazing their animals or harvesting grass and firewood in the conservation area, and it became a de facto open access area. 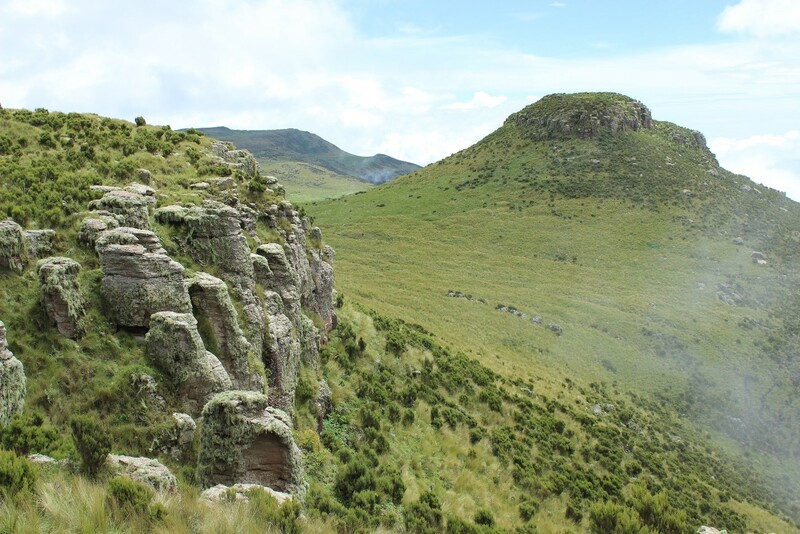 Though the high elevation (3200 – 3500m) and cold temperatures prevented people from plowing the area for croplands, it quickly became heavily grazed and remained that way for decades. In the late 1990s, a PhD student named Zelealem Tefera Ashenafi decided to conduct his dissertation research in Guassa, as it was one of the last remaining sanctuaries for the critically endangered Ethiopian wolf (Canis simensis). 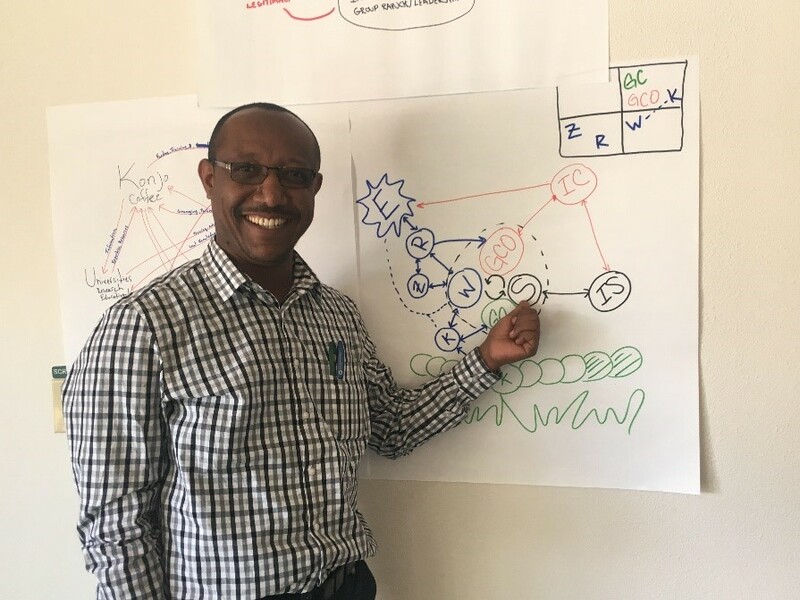 Backed by the Frankfurt Zoological Society, Dr. Zelealem and his colleagues worked with the communities to re-establish their rights to the land and reinvent their traditional management system in a modern context. In 2006, they successfully closed the area to allow it to recover from decades of heavy grazing and harvesting. In 2012, the Ethiopian government issued an official proclamation granting the Guassa communities rights to the conservation area. In 2015, they opened the area again for grass collection, and will continue to do so every three years (firewood and grazing are still banned). By all accounts, the area has made an astonishing recovery. When the area was closed for recovery from 2006 – 2015, the community noticed a difference in the species that were coming back. Five kinds of silvery shrub called “nachillo” (Helichrysum spp.) had always existed in Guassa, but now they seemed to be more widespread than anyone remembered during the Imperial and Derg regimes. Nachillo is highly aromatic, and some people would use it to keep termites and other insects from their household manure piles, which they used as fuel now that firewood collection was no longer allowed in Guassa. However, the strict rules that prevented them from collecting firewood now also prevented them from collecting or removing the nachillo, which they saw as a weed that competes with the guassa grasses. The community raised their concerns over the spread of nachillo to their NGO and local government counterparts on the Guassa management committee, who told them that an environmental impact assessment would need to be done before they could approve the removal of the shrub. Unfortunately, there was no money for this kind of study, and no Ethiopian scientists had the funding or the time to start one. As managers looked on, the nachillo continued to grow and spread. In 2014, Cara Steger was working at Addis Ababa University (AAU) teaching GIS as part of an international university project, the Ethiopia-Michigan Platform for Advancing Collaborative Engagement. On a three day weekend, she decided to take a break and visit the Guassa Community Conservation Area for a much needed break. Stunned by the beauty and passionate community-based management she found there, she knew she wanted to come back for her dissertation research. Fast forward two years and dozens of grant proposals later, and her dream became a reality. In July 2016, Steger and Girma Nigussie, a Master’s student from AAU, visited Guassa to talk with the local communities and Guassa management committee and try to understand how their research could best support local management objectives. Girma’s research focused on understanding how the land use and land cover has changed within the Guassa area in the last 15 years, so the pair surveyed over one hundred residents to ask about the major changes in the area. The answer was quick and resounding – nachillo was a problem, and it needed to be solved yesterday. Steger returned to AAU and enlisted the help of a plant biologist and wetland ecologist, Dr. Bikila Warkineh Dullo. Steger also reached out to Dr. Zelealem and his colleague at Frankfurt, Woldemedhin Zebene, to ask for their input. She visited Guassa again in March 2017 to conduct more systematic interviews and participatory mapping workshops to better understand the history of the area and get to know the managers. Admassu Getaneh and Tamalede Endelibu, the Directors of the management committee, threw their support behind the project too. In November 2017, the Center for Collaborative Conservation selected their team for the Cohort 9 fellowship, and planning for the project started in earnest. In February 2018, the CCC held a retreat in Fort Collins to give fellows some training in collaborative conservation and build relationships within and among the teams. Unfortunately, Admassu (a co-leader with Steger) was unable to attend from our team, so Dr. Bikila represented him instead. The workshop was an exciting time to exchange ideas and brainstorm new approaches to research and communication. Cara and Bikila left the retreat with a solid plan for their fellowship year, beginning with a workshop in Guassa this coming July. The goal of this workshop is to strengthen relationships between managers, resource users, local administrators, and scientists; to share and visualize different visions for the future of Guassa; and to co-design a monitoring program to better understand the social and ecological drivers of nachillo expansion in the conservation area. We look forward to sharing our progress with you in the fall!